I will be giving a talk at the Kinnelon Public Library, this Thursday, Thursday, Oct.24 at 7 PM, which is the 6th of 9 such planned talks this year, roughly a month apart, on the subject of Using Your PC or Laptop, in this case, about Email -- how to use Mail Clients and Webmail, what the Security Problems with Each Are, and How to Have All of Your Email at Your Fingertips on All of Your Devices, All of the Time. 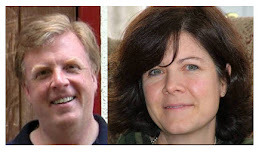 On Sunday, October 20th, 2013 you can take part in the first annual Silas Map Adventure orienteering event at Silas Condict Park in Kinnelon, NJ to honor late Kinnelon resident Bjorn Waalberg, the most intrepid hiker Ted and I have ever encountered (in the woods - no less!) and the creator of the Silas Condict Orienteering map. Join Kinnelon Boy Scouts Troop 277 and the Hudson Valley Orienteering Club on October 20th, and experience what an orienteering map adventure is all about. Orienteering is a fun sport which is something like a race with a treasure map. During an energizing run or hike, participants find checkpoints (called control points) with help of a map and a compass. Since you use map reading and compass skills, it is a race that includes using your head to find your way. Orienteering was one of Bjorn's very favorite sports! Those of you who knew Bjorn, know that whatever you did with him, fun was never far behind. You'll find it similarly fun and rewarding! The Silas Map Adventure is ideal as an annual event, too. Every year the control points are different, so there is always a new challenge even if you are in the same park. How does the first Silas Map Adventure get started? Orienteering meets have staggered start times. On October 20th, come to Silas any time between 10:30am and 2:30pm on October 20th and register! Registration is inexpensive: ($10 for a group of 2 and $15 for groups of 3-6). At the starting line, you will get to borrow a map and timing device as well as a compass. (Feel free to bring your own if you have one.) To complete a course takes about an hour. For those new to the sport, you should go in a group. If you wish, you can sit in on a brief instruction of how to use the compass and read the map before setting out. As soon as you complete the course, you can leave if you wish; or stay and have a picnic. Results for your team will be emailed to you by HVO. All are invited to bring a picnic lunch and continue to enjoy Silas even after you are done trying out orienteering. So get your teams organized and see you there! 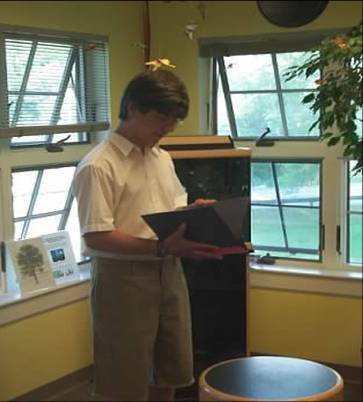 Kinnelon resident, Bjorn Waalberg spent over two years completing an orienteering map for Silas Condict Park to introduce this fun sport to the folks of Kinnelon, especially the young folks. He spent hundreds of hours in Silas Condict Park, often with his kids and his dog, creating and accuracy-checking the map that will be used for this event. Bjorn had dreams of expanding the love for orienteering to the high school, to the community at large, and of course to the Boy Scouts, an organization he enjoyed being involved in. Bjorn took such pride in teaching kids how to orienteer, and this map of Silas was to be the starting point. Due to his untimely death earlier this year, Bjorn is not here to see his vision complete, so his wife Liz is doing this for him. Liz asked the Hudson Valley Orienteering Club (of which Bjorn was an active member) and Boy Scout troop 277 be involved with completing this vision of inviting the community to try out this sport. Bjorn on an orienteering map adventure! Who would like to do orienteering? Orienteering can appeal to anyone of any age who likes the outdoors. Typically, beginners make up teams of 3-6 to complete the course. A team might consist of a few kids who want to try the sport out with an adult who ‘shadows’ them so that they do not get too far off course. Or, a team could be high school athletes who read the map and get from point to point as fast as they can. People in Norway, where orienteering is extremely popular, participate well into their 80s! A team could be a family that wants to take the adventure all together. As a team, they will work together to solve the question of which way to go to get to the next control point and what is the best route to take. Everyone ends up having a very nice hike in the woods with an adventure attached to it. What’s so fun about an orienteering map adventure? Orienteering is fun because it gives a game element to an invigorating hike in the woods! As a team, you solve the puzzle of where all the different control points are. Trying to finish the map quickly adds a layer of competition as well. Add to this, the gorgeous air and colors of October at Silas and you have a fabulous, fun, short hour-long adventure! Keep in mind, orienteering is a rain or shine event. As Bjorn, and any Norwegian, would say: there is no such thing as bad weather, only bad clothes! You can even do this sport in rain boots! with orienteering control point markers. Looking for a new way to get yourself or the entire family out in the beautiful nature this Fall? The entire Kinnelon community is invited to come out and try the fun and adventurous sport of orienteering at the Silas Map Adventure on Oct 20th in Silas Condict Park. For further information or questions, please contact the event director Robert Rycharski from HVO at: rrycharski345@optimum.net. Thanks to all of the people near and far who reached out with generous donations for making this event possible. Their gifts are helping to complete a dream and a vision and a goal that Bjorn had set but is sadly not able to complete himself. So they, HVO and troop 277 are all part of this gift to Kinnelon as well. And very special thanks to Liz, Bjorn's wife, for contributing this article and photos. 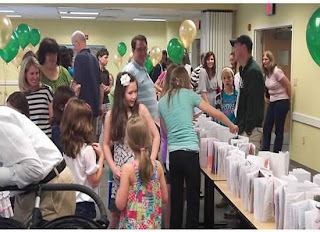 Celebrate Kinnelon Public Library's 50th Anniversary! 10/19/13 at High Point Brewery. In case you haven't seen the marvelously decorated marquis in front of the Kinnelon Public Library, or seen one of the bold flyers, please come celebrate Kinnelon Public Library's 50th Anniversary at the High Point Brewery in Butler, NJ! To call the Library, 973-838-1321 or visit the website: kinnelonlibrary.org. If you have questions, please don't hesitate to drop by the Kinnelon Library. Coming up on Sunday, October 6, 2013 is the third annual K-Fest celebrating Kinnelon, New Jersey! It takes place from 1pm to 5pm at Lake Rickabear off of Kinnelon Road. I wrote about the first one in K-Fest 2011 on 10/2/11 Celebrates Kinnelon Community. Since then, the event has only gotten better! K-FEST is sponsored by KAMELOT and Kinnelon Borough officials. KAMELOT, as described in KAMELOT Gets Ready For Kinnelon Community Event from the Tri-Boro Patch, "has been in the Kinnelon community for more than 16 years, sponsors presentations and programs that seek to steer the community's youth on the right path in terms of avoiding things like drugs, alcohol and behaviors such as bullying." Futhermore, "KAMELOT is a county-funded municipal alliance, which means that the majority of the organization's money comes from seized drug and weapon funds. 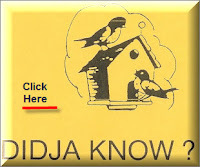 Additionally, the borough is required to match a certain amount of the funds." The organization includes members from the Kinnelon community -- the Kinnelon Police, the Kinnelon Public School system, and Kinnelon Borough Council. In 2011, Councilman James Freda served as the liaison to the organization. Kinnelon's Borough Council is actively involved with K-Fest. You'll find them managing the BBQs, offering the best burgers and hot dogs around, and ready to talk! Councilmen O'Dougherty and Freda with clown at K-FEST 2011. The festivities will be held at Lake Rickabear on October 6th from 1–5 PM. Park at the Kinnelon High School and enjoy the free shuttle service available all day. At the same time, you can learn more about the Kinnelon Food Pantry, the Kinnelon Public Library, the Kinnelon Volunteer Animal Shelter and the Friends of Chas. Take part in K-FEST 2013! Entry is FREE and open to all Kinnelon residents. For a copy of the K-Fest flyer, click here. Image credit: Thanks to Susan Jaeger Ardrey. 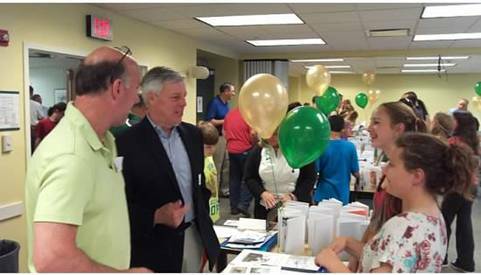 Kinnelon Public Library 50th Anniversary Kickoff Student Starlit Showcase Event: Relive the Magic! 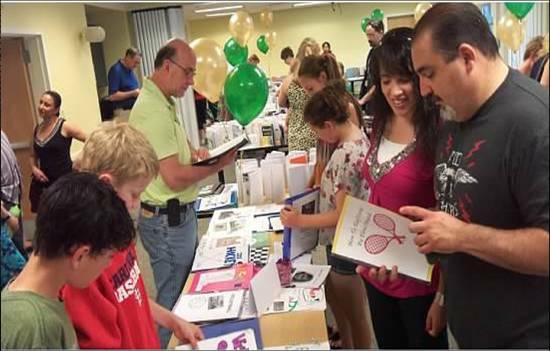 Were you able to attend the Kinnelon Public Library 50th Anniversary Kickoff Event on Saturday, June 8th and experience for yourself the "Student Starlit Showcase" Event? What did you think? I thought it was pure magic. By the amazing talent of our children. By the enthusiastic response of everyone who attended. By the borough-wide collaboration - from parents, grandparents and friends, students and teachers to Kinnelon School Principals, Borough Council members, members of the Kinnelon Board of Education, and Trustees of the Kinnelon Library, CLL and the Friends of the Kinnelon Library, our Superintendent of Schools and our Mayor, and everyone in between! By the thoughtful showcase of students' literary works in a way that demonstrated the continuum of learning from 3rd grade through 8th grade. By the boundless energy of 'Hurricane Aileen' - aka Aileen Florio - who masterminded (or rather mistressminded?) this unbelievable event, and produced the summary below. KINNELON, NJ—June 15, 2013. More than 500 members of the community joined a borough-wide celebration of the 50th anniversary of the Kinnelon Public Library on Saturday, June 8th from 5:00 to 7:00 pm at the library. 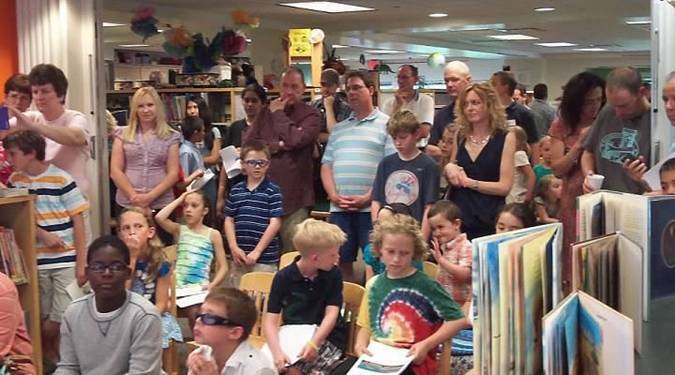 The event, titled “Student Starlit Showcase,” featured a collaborative effort with Stonybrook Elementary School and Pearl R. Miller Middle School and showcased information books and other texts written by students in grades 3 through 8. 50th anniversary at the “Student Starlit Showcase” on June 8. The event, hosted by the Kinnelon Public Library, drew crowds including guests Mayor Robert Collins; Borough Council members Carol Sventy, Ronald Mondello, and Gary Moleta; Board of Education members Marianne DeAlessi, Brian Davin, Michael Petruccelli, and Marcy Pryor; Superintendent of Schools Diane DiGiuseppe, school principals Jodi Mulholland (Kiel), Mark Mongon (Stonybrook), Jack Hynes (PRM) and assistant principal Louis Caruso (PRM); as well as teachers Gina Koonjy, Annika Levitt, and Nancy Bosch (Stonybrook), Karen Baker (Kiel), Marisela Lane (ESL), Jeanne Chamberlain, Lisa Kelly, Amy Stickley, Faith Vanderzee, and Aileen Florio (PRM). and Lisa Kelly attend from PRM. Gina Koonjy celebrate with students and residents. and daughters Ella and Olivia. Mayor Bob Collins talk with seventh-grade students. Dr. Vosatka and Ms. DiGiuseppe greeted guests as they arrived to the event and directed students to the raffle table in the main lobby. 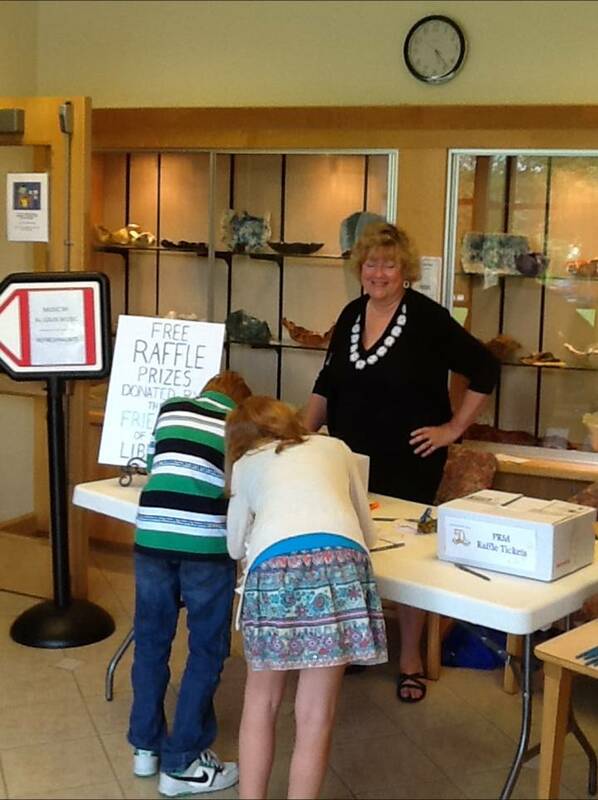 Library Trustee and Board Secretary Linda Farmer and Borough Councilwoman Carol Sventy invited each student to fill out a free raffle ticket. Prizes, generously donated by Friends of the Kinnelon Library and the Center for Lifelong Learning (CLL), included two Nooks, two iPod Shuffles, and gift cards for iTunes, Dairy Queen, and Subway. Al Louis Music (a.k.a. 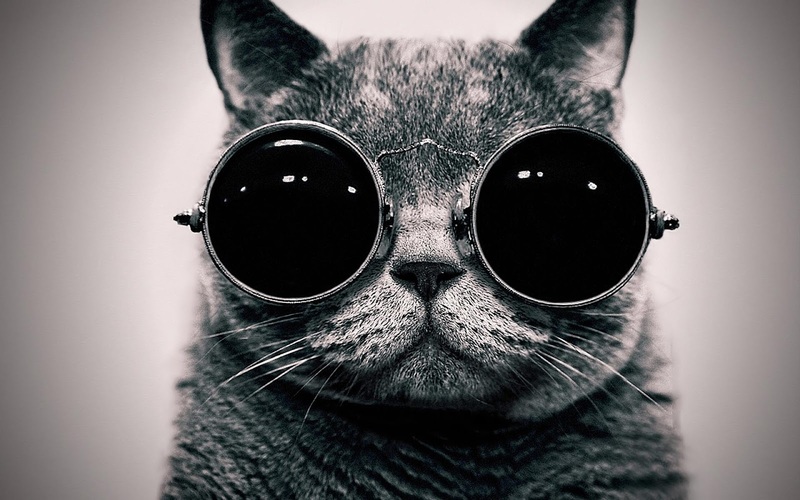 Alan “Mr. 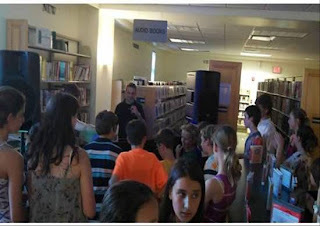 T.” Tedesco, Stonybrook School band director) donated his DJ services on the main floor, where the lights were dimmed and strobe lights provided a party atmosphere for kids. He took music requests throughout the evening and announced raffle winners toward the end of the event. Also donated were platters of cookies from Baker’sPerfection in Rockaway. party atmosphere for the library’s 50th anniversary. Upstairs, the meeting rooms housed the writing showcase—a gallery filled with more than 250 information books and other texts written by students in Stonybrook and PRM schools. The writing pieces were the result of a concerted K-8 formal implementation of Writing Workshop, an integral component of the district’s writing curriculum. With information writing as one of the three pillars of the Common Core State Standards, all students in K-8 learned and practiced the techniques specific to writing texts that teach readers. Topics ranged from pets to pollution, soccer to skateboarding, food allergies to Ford’s Theater. admire the writing of students. 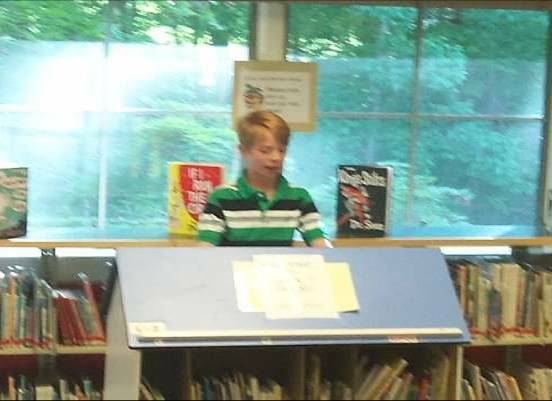 In the children’s library, students who volunteered to talk about their work and the writing process captivated audiences. on 50 years of service before delivering his presentation. “It was a great evening where all children were celebrated for their creativity and hard work,” said Karen Baker, mother of three and kindergarten teacher. 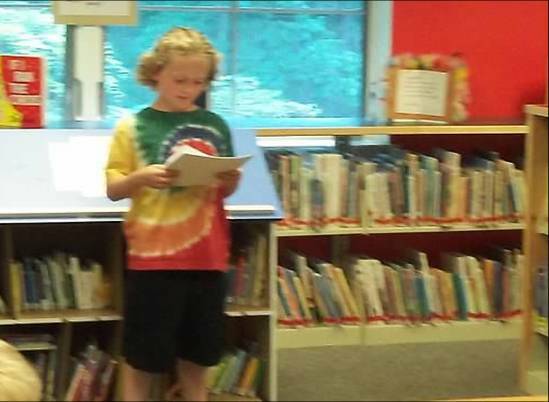 Her son Kevin, a third grader at Stonybrook, gave a presentation of his writing at the event. “It was fun listening to other kids talk about their writing,” Kevin commented. simultaneously underway at both ends of the children’s library. why he chose to write his information book about Ford’s Theater. experiences writing his information book. Resident Karen Carroll said, “This was a wonderful opportunity to bring the entire community together. 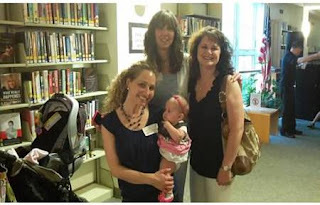 It was so nice to see so many different people celebrating the library's 50th anniversary. There were children of all ages, parents and grandparents, aunts and uncles, teachers and school officials, and many others from town. It was great to see the kids' writing projects and to hear them discuss their work. What a perfect opportunity for these kids to gain skills in public speaking – skills, which will serve them well in the future. We all look forward to attending more events like these in the future." Carroll’s three children each presented their writing. Third-grader Kristyn said, “During this writing presentation, I was very proud of when I spoke to more than 20 people about my writing process. My grandparents and parents supported me by just standing near me. I also enjoyed the refreshments and music. This time will always be a fun memory." Her brother Braeden, also in third grade, agreed. 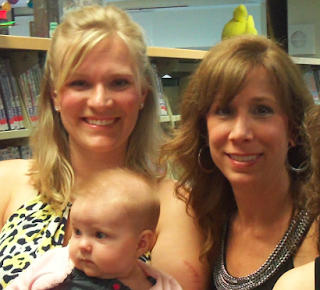 “I enjoyed going to the library's 50th anniversary. I liked sharing my writing with the audience. This was a very fun experience for me." 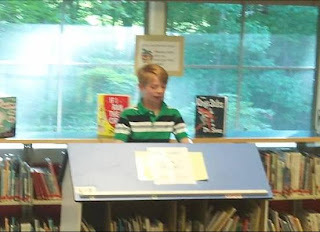 Fifth-grader Graeme added, “The 50th anniversary of the library was very organized. It was really fun presenting our non-fiction books to other kids. Overall, it was a great experience." Yet another room featured Kinnelon High School student Brett Smith who gave presentations on the latest apps and information technology. 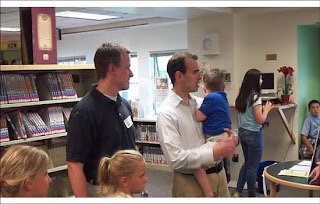 Students and parents rotated through his room to learn how to make the most of their mobile phones, iPads, and other technology to access educational and other informational apps. "Being part of the library's 50th anniversary was a really cool opportunity,” Brett commented. “I was able to display many applications for Apple and Android devices. I also showed computer programs as well as the TI N-Spire graphing calculators." The library’s golden anniversary has been recognized and honored by Congressman Frelinghuysen, who entered a brief history of the library into the Congressional Record. 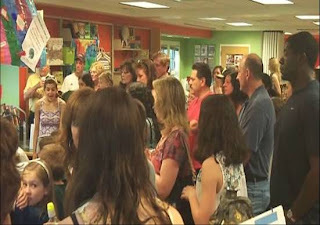 The Kinnelon Public Library is a free provider of education and information for the people of Kinnelon, New Jersey and beyond. With 18 computers total on both the first and second floors dedicated to public use, and free Internet access, the library offers many programs for both adults and children as well as free materials, classes, exhibitions, programming and more to everyone from toddlers to scholars. Founded in 1963, the Kinnelon Public Library is celebrating its 50th anniversary in 2013. For more information, visit http://KinnelonLibrary.org. I invite you to share this story with your friends and family; congratulate every one of our young writing stars. If you couldn't attend the Student Starlit Showcase, ask a young star to share his or her written work with you. Then, come visit the Kinnelon Public Library. Explore its wonders. If you don't yet have one, register for your own public library card. Help us continue the magic of the Kinnelon Public Library 50th Anniversary celebration! P.S. 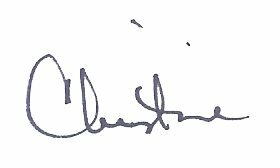 : I'll share with you in a separate article Congressman Frelinghuysen's entry about the history of the Kinnelon Public Library into the Congressional Record. Those interested in the Computer talk at the Kinnelon Library on Cloud Backup, Tablets, and What is My Computer Doing, originally shown as scheduled for tomorrow, Thursday May 23, should make note of the change to Thursday June 20. Sorry for the last minute change, but with the last minute scheduling of my daughter's softball practice and other things, something had to give!